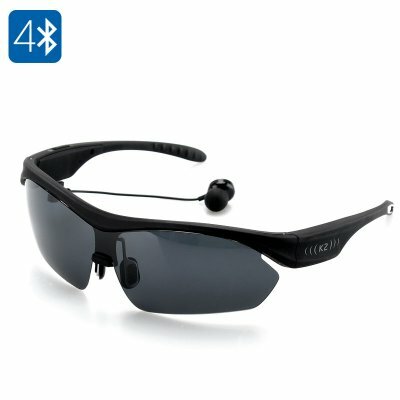 Successfully Added K2 Polarized Bluetooth Sunglasses - PC Polycarbonate Frame, Noise Reduction, Handsfree A2DP (Black) to your Shopping Cart. Looking to escape the rat race and get away on holiday this year? Then be sure to pack these polycarbonate Bluetooth sunglasses so you keep in touch, protect your eyes and chill in style on those golden sands. By utilizing the voice command functions available on many phones these trendy K2 Bluetooth sunnies let you interact directly with your phone hands free so you phone can stay safely tucked away. Working on Bluetooth 4.0 and with CVC noise reduction you can listen in stereo to your favorite music or converse on the phone total hands free without interruption from background noise. Make sure to grab these smart polarized shades before heading away to the sun as they can do much more than protect your eyes from the sun. By blocking out the majority of reflected light the detachable polarized lenses in these sunglasses provide excellent protection from the glare. Unlike normal sunglasses that reduce all light equally, polarized lenses selectively block out light reflected off horizontal surfaces. This selective light blocking reduces glare much more. Atmospheric effects such as fog and rain scatter light from the sun and can make it hard to see but these glasses make block much of that scattered light and make it easier to see. Additionally when light is reflected or water you can use these glasses to see clearly and beyond the surface so can be useful when fishing or boating. In snowy conditions the suns light can make it hard to see as the white snow reflects high amounts of light but by using the glasses you won’t have to squint to see clearly and will be able to pick out hazards more easily. They will also reduce the chance of headaches from having to squint and make it safer as well as more enjoyable for you on the ski slopes.